Fred discusses the legend of Santa Claus in Canada. Anja: So, Fred, tell me, how is the Santa in Canada? Fred: Well, Anja, I think, listening to the story that you just told me, I believe that it's quite different. Anja: Is it? How is it different? Fred: It's very different because, well, actually, Santa Claus comes on the 25th of December. He doesn't come of the 6th of December. I've never heard that before, and so Santa Claus, well, as I just mentioned comes on the 25th, and then he has these little helpers. They're called elves. He has many of them, and also they live in the North Pole and together they work at making the toys for the kids. Anja: Oh, really, so they live in the North Pole and not in the forest like the Swiss Santa Claus? Fred: No, they live in the North Pole. Anja: That must be cold. Fred: Yeah, well you see, it's true yeah, you're right. It is cold but the idea is that it's Christmas and so in Canada or in the United States it is cold. There's a lot of snow and so the image of Santa Claus is actually like snow. He has a big white beard, and he's dressed in this red suit, you know, and he also has a wife. Fred: Yeah, Mama Santa Claus. Anja: Oh, really, I didn't know that. Fred: Yeah, yeah, yeah. And so they work together at bringing the kids their gifts that they've ordered, because you see in Canada the kids, maybe a month ealier...or two, three weeks before the 25th write a list of what they want for Christmas. Anja: Oh, really. That must be a pretty long list. I remember when I was a kid, I always had a lot of things I wanted. Fred: Yeah, I think so, so Santa Claus has a lot of work right. Anja: Oh, poor Santa Claus. Fred: And so the kids write a list, and so for instance if somebody wants a bike, he writes, 'I want a bike' and then the list is being sent to the address in the North Pole. 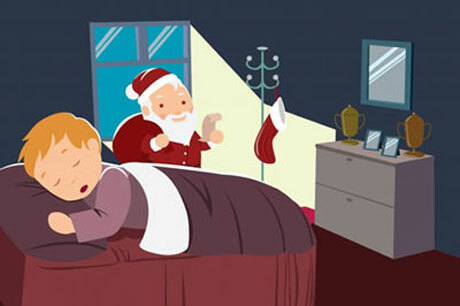 Santa Claus takes this into consideration, meaning that if the kid has been good all through the year, he will be receiving that gift, but if he hasn't, then maybe he won't get the gift on the 25th. Anja: Oh, so better be good if you want your presents. The image of Santa Clause in Canada is actually like snow. My image of Egypt is sun, sand, camels and pyramids. The image of L.A. is Hollywood and movie stars. The kids write a list of what they want for Christmas a month earlier. I submitted my paperwork a month earlier than the deadline. We received the shipment a month earlier than expected. That must be a pretty long list. I have a long list of things to do this weekend. They had a long list of complaints. For instance, if someone wants a bike, he writes, "I want a bike." Some sports are a little dangerous, for instance, Formula one. We don't have to go to an action movie, for instance we could see a comedy. If a kid has been good through the year, he will receive his gift. The economy has been slow through the year. so far I've made it through the year without help from my parents. Anja compares Christmas tree traditions. Fred discusses Santa Claus in Canada. The legend of Santa Claus in Switzerland. Is tourism a good thing? Kara talks about speaking Spanish. I have a of reasons why I don't really like him. I have this of her as a cheerleader. He works a lot the week and is usually tired by the weekend. They need a lot of things, , they don't have a bed. She had the baby a than the due date.